About 14½" (37 cm) deep and 12" (30.5 cm) wide, washed. While rummaging in a secondhand bookstore in Helsinki I was lucky enough to find an original 1933 copy of Kodin Neuletöitä, a lovely little book filled with patterns for classic Finnish socks and mittens. A pair of traditional socks with a lovely decorative twined knitted border served as inspiration for the Lyyli Project Bag. 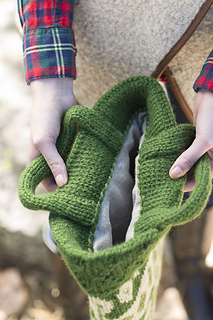 Knitted in a beautiful pure wool yarn, Lyyli is a quick and easy project to make. 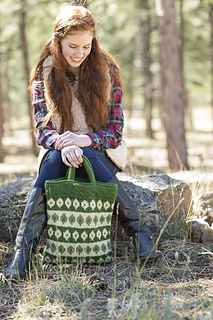 The simplicity of the two-color stranded colorwork and twined crook stitch detail pattern at the top of the bag makes it a perfect introduction to these classic Nordic knitting techniques. “Pockets,” or simple bags with short handles, were used traditionally to carry knitting around in—the pocket was held over one arm and the knitter could move around still knitting. 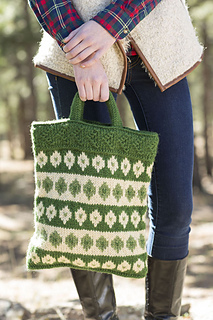 Knitted in the round with a simple linen lining, the Lyyli Project Bag makes an ideal contemporary knitting or project bag. Needles Size U.S. 9 (5.5 mm) 24” (60 cm) circular (cir) and set of 4 doublepointed (dpn). Adjust needle size if necessary to obtain the correct gauge. Notions Marker (m); ¾ yd (68.5 cm) of lining fabric; matching thread and sewing needle; tapestry needle.